Part Used & Method for Pharmaceutical Preparations: The entire plant is gathered in summer or autumn, dried in the shade and cut into pieces. Properties & Taste: Bitter, pungent and cold. Meridians: Liver, gall bladder and kidney. Functions: 1. To reduce heat caused by deficient yin; 2. To cool blood and release summer heat; 3. To relieve malaria. 1. Malaria. Sweet wormwood (Qinghao) is used alone or with Scutellaria root (Huangqin) and Pinellia tuber (Banxia) in the formula Hao Qin Qingdan Tang. 2. Late stage of febrile disease, with pathogenic heat damaging yin and body fluids, manifested as fever, fever at night, and subsiding in the morning without presence of sweating, red tongue proper with scanty coating and thready, rapid pulse. Sweet wormwood (Qinghao) is used with Moutan bark (Mudanpi), Turtle shell (Biejia) and Fresh rehmannia root (Shengdihuang) in the formula Qinghao Biejia Tang. 3. Heat signs due to deficient yin manifested as afternoon fever and night sweating. Sweet wormwood (Qinghao) is used with Large-leaf gentian Turtle shell (Biejia), root (Qinjiao), and Anemarrhena rhizome (Zhimu). 4. Invasion by summer-heat manifested as fever, dizziness and headache. 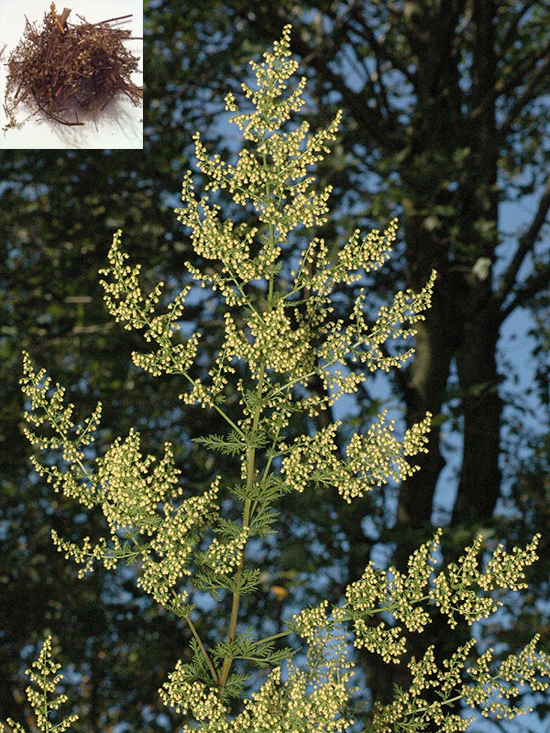 Sweet wormwood (Qinghao) is used with Mung bean (Ludou) and Lotus leaf (Heye).